I recently received a book I've been anxiously waiting for: John Hargrove's "Blackfish/dp/1137280107/ref=sr_1_1?ie=UTF8&qid=1427221203&sr=8-1&keywords=hargrove+beneath+the+surface">Beneath the Surface: Killer Whales, SeaWorld, and the Truth Beyond Blackfish" (the book was written with Howard Chua-Eoan and the Kindle edition can be found here). 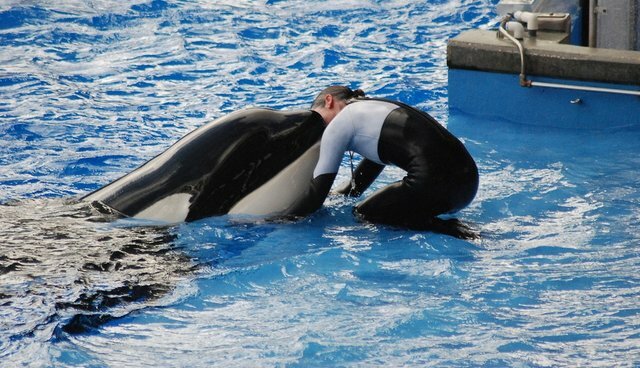 Hargrove is a former senior orca trainer at SeaWorld and was in the award-winning documentary "Blackfish." Nearly every page in Hargrove's book made me stop and think about how we humans have had enormous and wide-ranging negative impacts on the lives of numerous individuals of many diverse species who we keep in captivity for our - not their - benefit. Orcas are the main topic of Hargrove's book, and in this book we meet many orcas up close and personal and see how just how we make huge and irreversible messes of their lives "in the name of entertainment." Hargrove's book is deeply personal and he bears his heart as he writes about orcas he came to know well and how "SeaWorld's wildly popular programs were both detrimental to the whales and increasingly dangerous for trainers." "In 'Beneath the Surface,' Hargrove paints a compelling portrait of these highly intelligent and social creatures, including his favorite whales Takara and her mother Kasatka, two of the most dominant orcas in SeaWorld. And he includes vibrant descriptions of the lives of orcas in the wild, contrasting their freedom in the ocean with their lives in SeaWorld. Hargrove's journey is one that humanity has just begun to take - toward the realization that the relationship between the human and animal worlds must be radically rethought." I really enjoyed the entire book, and I found a lot of food for thought in Chapter 12 called "A Vision for the Future." Hargrove begins: "The prospect of a SeaWorld in financial decline does not fill me with glee. The company may be motivated by greed and it may have exploited both orcas and trainers, but SeaWorld is, paradoxically, the best hope for the 30 killer whales that it owns." Clearly, the whales can't be released into the wild. And, of course, clearly they shouldn't breed. SeaWorld has tampered with and changed their fertility cycles, the animals are clearly socially dysfunctional, and they are imprinted on humans. It would be a recipe for disaster if any were released into the wild. Mr. Hargrove also writes, "Only SeaWorld has the staff and the know-how to pay close attention to the ills of captivity. The problem is that SeaWorld can't make that argument because it would contradict the current image it projects of itself as the benign protector of the orcas in its care. In essence, SeaWorld has to change its business model and build out sea pens that the public can visit - for the price of admission - to learn how captivity transforms cetaceans" (see also "Why SeaWorld Can't Float: Censorship and Business Ethics"). These sea pens are the only hope for these amazing and magnificent giants of the water. I highly recommend "Beneath the Surface" to readers of all ages, including those youngsters about whom Hargrove writes, who want to be just like him when he trained orcas to perform stupid and unnatural tricks. Hargrove is a very courageous man, and his book is open and honest and we should all thank him for taking the time to write it. I'm sure the orcas and all other animals languishing and being used and abused in captivity would thank him if they could.